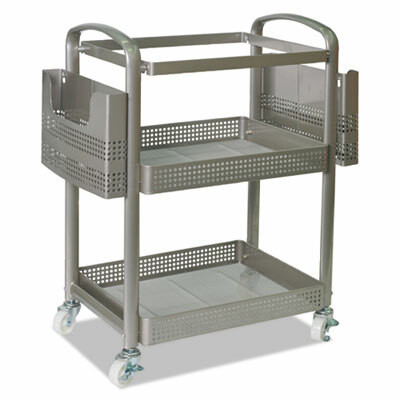 Multi-use material handling carts for all markets. Mold-, mildew-, UV- and tear-resistant vinyl liner permanently riveted to frame. Kiln-dried hardwood base with 3" non-marking polyurethane swivel casters. Carts nest together for easy shipping and storage. Color: Gray; Capacity (Weight): 600 lbs. ; Caster/Glide/Wheel: 3" Non-Marking Polyurethane Casters; Material(s): Steel; Vinyl; Wood; Rubber. 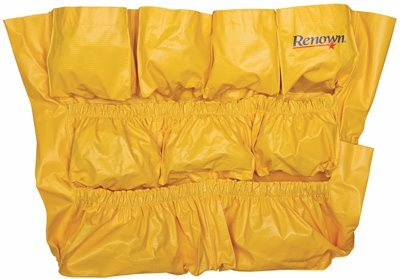 Renown� nylon reinforced vinyl caddy bag. 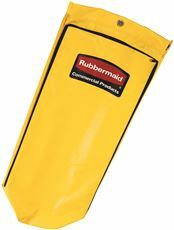 Yellow in color; twelve pockets of various sizes to accommodate most cleaning products. Velcro strip straps allow it to fit securely on to the rim of 20, 32 and 44-gallon waste containers. Durable nylon reinforced vinyl is strong and easy to keep clean. Twelve pockets of various sizes to accommodate most cleaning supplies. Snaps securely onto the rim of BRUTE 44-Gallon Containers (2643 and 2643-60). 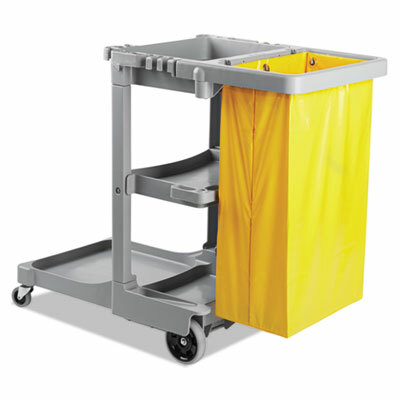 Collect waste and transport tools for efficient cleaning with this janitor cart. It measures 21-3/4" wide and features a zippered bag for easy trash removal.^^Also included is a smooth, easy-to-clean surface with a front platform. The platform is able to hold a mop bucket or up to a 32-gallon BRUTE� container. Sprayer Bottle with Trigger. 32 Oz. 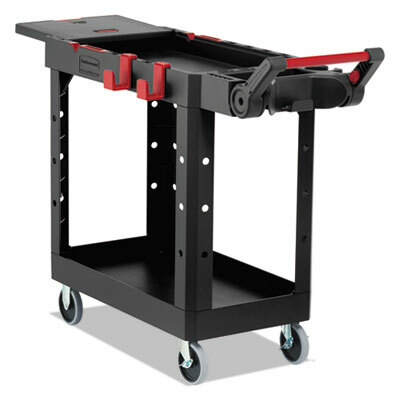 Durable resin construction helps create a strong, two-shelf utility cart. Molded-in handle allows for easy steering on the go. Convenient swivel casters allow multi-directional travel. Fixed shelves with a raised lip provide a sturdy storage spot. Color: Gray; Capacity (Weight): 300 lbs. ; Caster/Glide/Wheel: Two Swivel Casters, Two Fixed Casters; Material(s): Resin. Vinyl replacement bag with zipper for Janitorial cart. Collect waste and transport tools for efficient cleaning. Smooth, easy-to-clean surface. Zippered bag for easy trash removal. 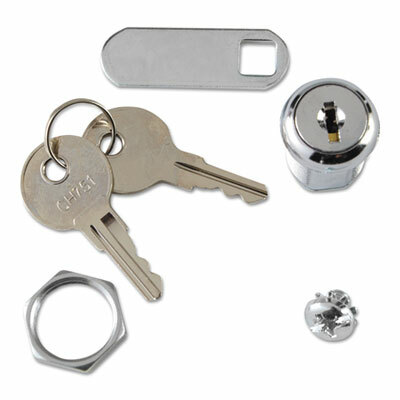 Select security and durability with a replacement lock and key set. 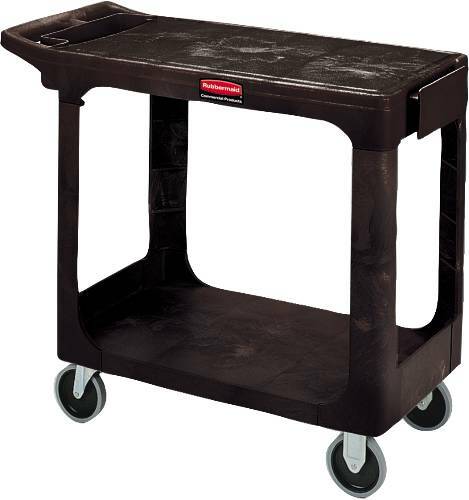 Designed to work with Rubbermaid Commercial� Locking Janitor Cart Cabinet 6181 (sold separately). Helps secure cleaning supplies in cabinet - keeping hazardous chemicals out of reach. 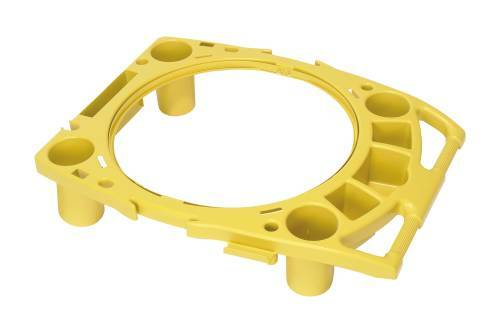 Accessory Type: Lock & Key; For Use With: Rubbermaid� Commercial Locking Janitor Cart Cabinet 6181. Flexible, high capacity storage solutions and tool organization. 5 cu. ft. of storage space and 20% more waste capacity than 6173. Features Lock 'N Go bucket attachment. Rubber Tool Grips hold handles upright. Includes two removable 10 Quart Disinfecting Caddies. Non-rusting and easy-to-clean aluminum and structural web plastic construction. 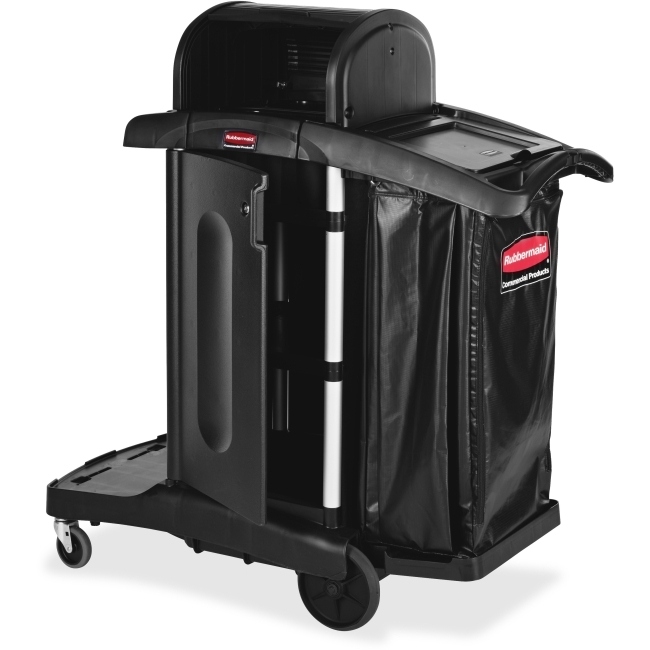 Comfort Grip cart handle provides easy maneuverability and includes lobby dust pan/vacuum holder. Keep paperwork handy when you need it and out of the way when you don't. Wheels glide with ease for mobility and lock for stability. Accommodates letter or legal size hanging files. Color: Silver; Caster/Glide/Wheel: Four 2" Dual-Wheel Hooded Casters (2 Locking); Overall Width: 22 1/4"; Overall Depth: 12 3/8". Removable caddy with rigid dividers. Easily organize and access amenities and cleaning supplies. Versatile design allows staff to efficiently service guest rooms and public areas. High performance material construction provides strength and rigidity to withstand rigorous daily use. 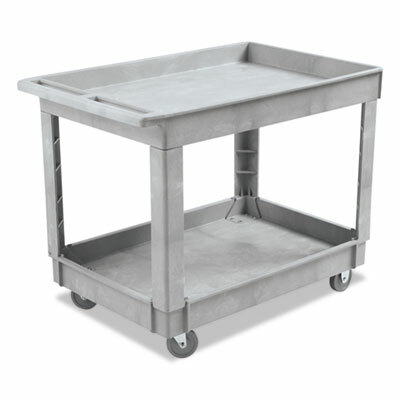 Accessory Type: Caddy; For Use With: RCP1902465, RCP1902466; Material(s): Teflon� Fabric; Color(s): Dark Gray. 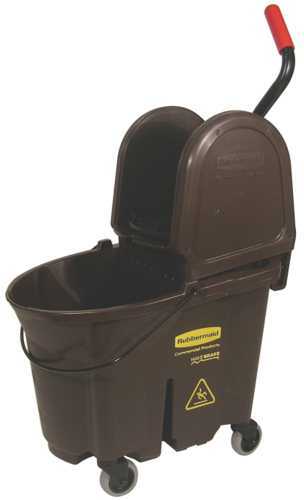 Rubbermaid's Wavebrake� 16-32 ounce mop capacity, downward pressure molded plastic wringer. Mop wringer made of premium tubular steel and structural web molded plastic. Brown in color. 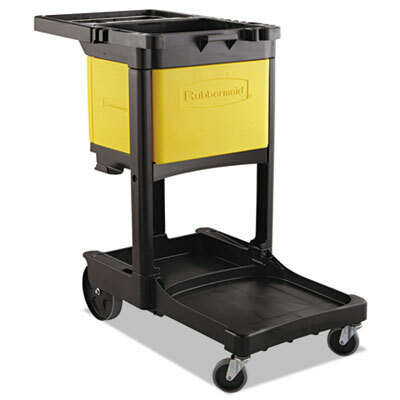 The Rubbermaid Commercial Utility Cart with Zippered Yellow Bag collects waste and transports tools efficiently on 8" non-marking wheels and 4" casters. 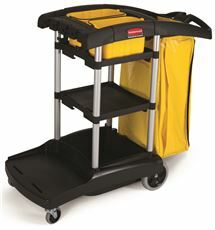 This versatile utility cart has 3 lipped shelves, and a zippered yellow vinyl bag for collecting refuse or launderable items. The surface of the top shelf features tool grips for keeping frequently used items at hand wherever this service cart travels. Color: Blue; Caster/Glide/Wheel: Four 4" TPR Swivel Casters; Material(s): Structural Foam; Overall Width: 21 3/4". Accommodates all RCP Microfiber Products. Large 7.25 cu. ft. locking cabinet area.5 cu. ft. of storage space. 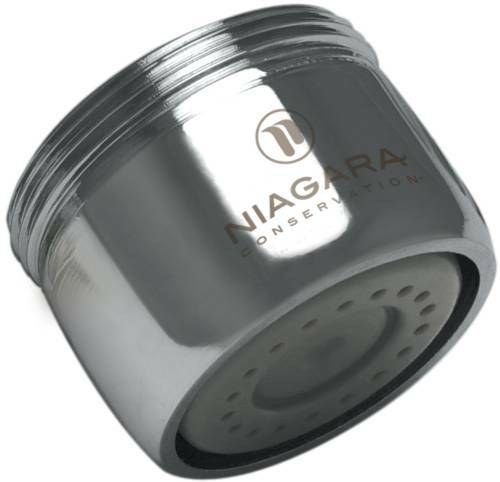 Meets JCAHO requirements: locking cabinet; locking security hood; waste cover Lock 'N Go bucket attachment. 4" quiet casters and 8" wheels. Rubber Tool Holders (4) in front and (1) in back. 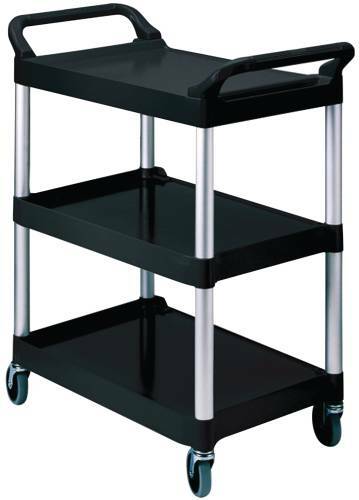 Color: Black; Caster/Glide/Wheel: Four Casters; Overall Width: 22"; Overall Depth: 48 1/4". Durable truck designed with a seamless molded polyethylene body. 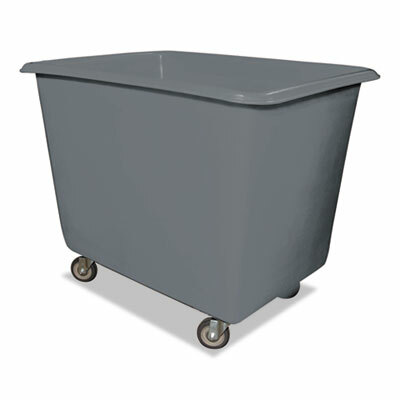 Sturdy base with 4" non-marking polyurethane swivel casters allows for easy transportation. "Bolt-Through" body attachment. Smooth finish with rounded corners. Ships fully assembled. Carts nest together for easy shipping and storage. Color: Gray; Capacity (Weight): 800 lbs. ; Caster/Glide/Wheel: 4" Non-Marking Polyurethane Casters; Material(s): Steel; Polyethylene; Rubber. 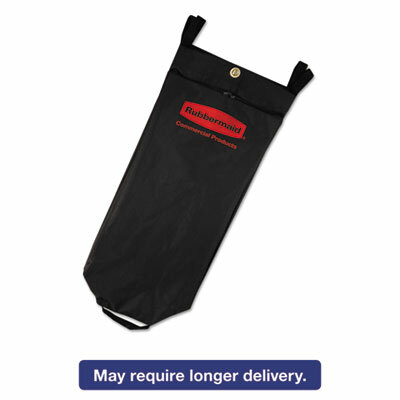 Keep your Rubbermaid� Commercial housekeeping carts looking new with high-quality replacement bags. Heavy-duty fabric bag stands up to rough use. Tri-hook system ensures that bag remains securely in place. Application: Cleaning/Laundry Cart; Capacity Range (Volume) [Max]: 26 gal; Material(s): Fabric; Depth: 10 1/2". 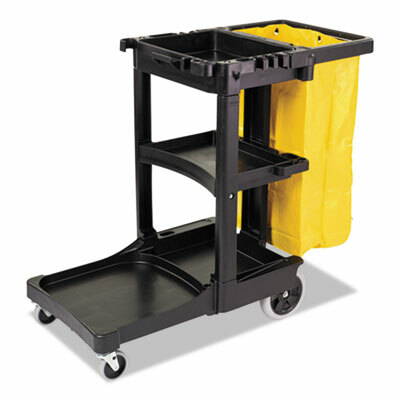 Select a janitorial cart with strength and security as well as an attractive appearance. Pre-assembled locking hood and doors provide additional security. 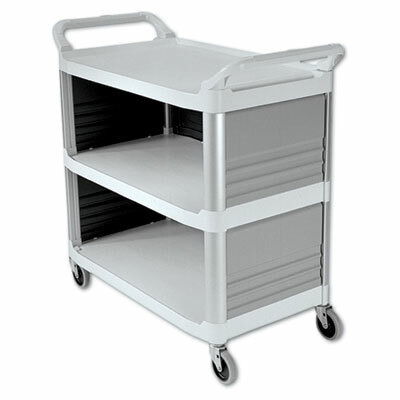 Spacious cart provides plenty of storage - up to 7.25 cubic feet of space, with removable bins and caddies. Its compact size allows it to fit in constrained spaces. Durable 8" ball bearing wheels and quiet 4" casters. Interchangeable handles and removable platform. Mop bucket platform with securing grooves keeps WaveBrake� or microfiber charging buckets securely attached to cart. Color: Black; Caster/Glide/Wheel: 8" Ball Bearing Wheels; 4" Casters; Material(s): Plastic; Overall Width: 23 1/10". Won't rust, dent, chip or peel. Lightweight for easy maneuverability and quiet operation. No sharp edges to nick walls or furniture. Two-shelf cart with a sliding drawer beneath the top shelf and two locking doors beneath the bottom shelf. Color: Black; Capacity (Weight): 200 lbs. ; Caster/Glide/Wheel: Four 4" Non-Marking Swivel Casters; Material(s): Heavy-Duty Polypropylene. 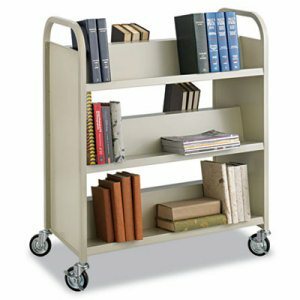 Mobilize your books, magazines or research collections. Sturdy steel all welded construction with four casters (two locking) for easy mobility. No assembly required. Six shelves. Color: Sand; Capacity (Weight): 300 lbs. ; Caster/Glide/Wheel: Four Casters (2 Locking); Material(s): Steel. Sized to carry large loads and reduce return trips. Rounded corners won't damage walls. Upscale appearance is ideal for institutional, warehouse or front office use. Large textured shelves hold a variety of equipment and supplies. Durable, structural web construction resists scratches, chips and rust. Lightweight and easy to handle with quiet, nonmarking casters. Color: Off-White; Capacity (Weight): 300 lbs. ; Caster/Glide/Wheel: Four 4" TPR Swivel Casters; Material(s): Structural Foam/Brushed Aluminum. Constructed of high-strength ABS material, durable enough to stand up to everyday use. 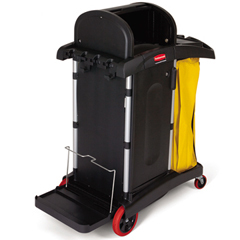 Compact design fits easily on most housekeeping and cleaning carts. Built-in compartments house up to three different tool attachments: Top Shelf: Quick Change Microfiber Frame, Middle Shelf: Quick Change Duster Frame, Bottom Shelf: Quick Change Squeegee, Brush or 3-in-1 Tool. Easily installed to compatible carts with enclosed hardware (instructions included). 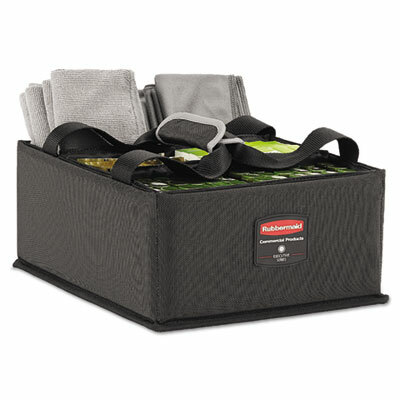 Accessory Type: Storage Tray; For Use With: Rubbermaid� Commercial Cleaning Carts; Material(s): ABS; Color(s): Black. Fits 6173-88 cleaning cart. Durable, easy-to-clean plastic. 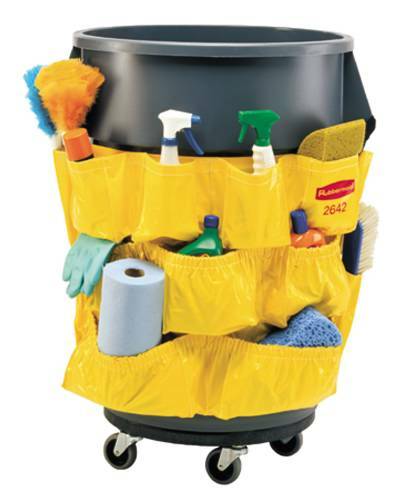 Accessory Type: Cabinet; For Use With: Rubbermaid� Commercial Cleaning Carts; Material(s): Plastic; Color(s): Yellow. 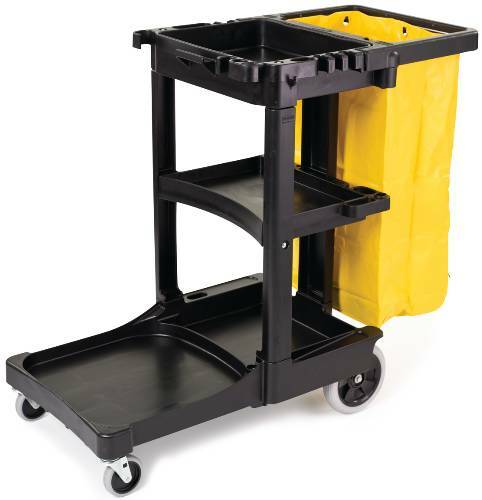 Roomy cart makes it easy to transport mop buckets, cleaning supplies, restroom stock and more. Molded-in tool hooks keep mops, brooms and extension wands upright and ready for use. Easy-to-clean durable vinyl bag is ideal for either waste or linen collection. High-impact polyethylene withstands the rigors of heavy use. Color: Gray; Caster/Glide/Wheel: Two 3" TPR Swivel Casters; Two 8" TPR Wheels; Material(s): Polyethylene; Overall Width: 22". The heavy-duty adaptable cart provides superior versatility for tackling whatever task is at hand. 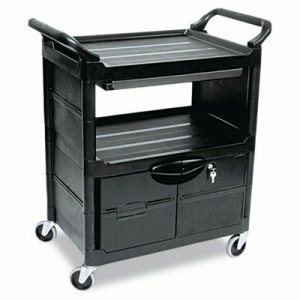 Crafted of structural foam, this rolling service and utility cart can support up to 250 lb per shelf while reducing the need for time-consuming user modifications Features a variety of integrated features including an ergonomic adjustable handle with four positions for maximum comfort, a flip-up shelf, a slotted rim for small tool storage, two snap-in hooks for wrapping extension cords and locking casters to keep the cart stable during use. 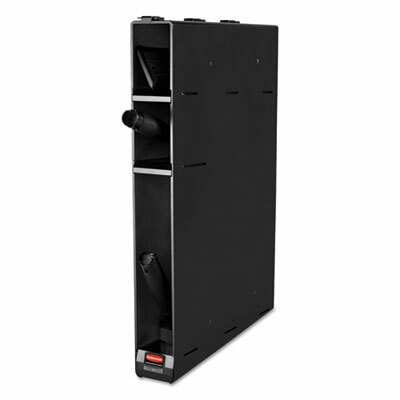 Color: Black; Capacity (Weight): 500 lbs; Caster/Glide/Wheel: Four Casters (2 Locking); Material(s): Foam HDPE.